A couple of monthes ago I was searching online for unique gift baskets and I ran across Gourmet Gift Baskets. 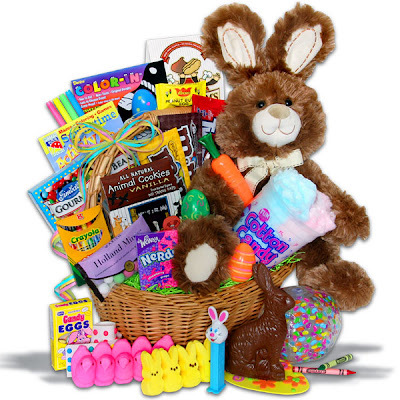 I was intrigued by all the different themed and occasion baskets in a variety of sizes. From breakfast to beer- themed baskets and care packages to wedding baskets, this site has something for every occasion! So, I was thrilled when Gourmet Gift Baskets gave me the opportunity to do a review and a giveaway. 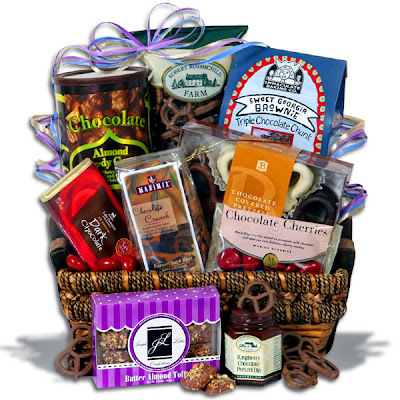 I was beyond excited when I heard my basket was coming and that they were sending me a Chocolate Gift Basket Classic – Sweet Decadence basket! As a confirmed chocoholic, I couldn’t wait to see it! When it arrived this week, I was impressed by how beautifully it was packaged! I love the wicker basket (that I’ll be able to continue to use) as well as the pretty multi-coloured ribbons that give it a festive appearance! The chocolate basket itself contained a wonderful variety of products! Despite our best attempts to wait and open it up later, I ended up opening it right away so we could look at all the items in the basket! Over the last few days, we have tried all of the chocolate and there were a few items that I particularly loved! My favourite item was the Chocolate Almond Pecan-dy Crunch by Morley Candy Makers! I discovered that it was pecans and almonds mixed with popcorn, covered with caramel and then coated with chocolate! What an amazing decadent combination! I was also thrilled that the tin was so large because I kept going back, thinking that I must have eaten it all, and there was even more! Another favourite item was the Chocolate Crunch Snack Mix by Marimix. It consisted of a mix of multigrain cereals, baked with chocolate and then dusted with cocoa powder. It was the last item in the basket that we tried because I didn’t think I would like it. I discovered that I actually really liked it! It had a rich taste and texture to it and was incredibly tasty! The last item that I really liked were the Marich Chocolate Covered Cherries. I generally am not a big fan of cherries, but I wanted to try them out. It turns out I loved them! The cherries were a bit tart and they were a great balance to the sweetness of the chocolate! In every case, the chocolate used was obviously of the highest quality – it was rich and smooth and had none of the waxy taste that you sometimes find in lower-quality chocolate. I would recommend Gourmet Gift baskets to anyone thinking about indulging in a basket for themselves or giving a gift to a friend, family member or work colleague!